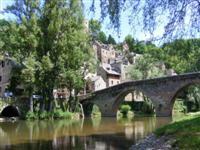 Below you you'll find a list of self-catering walking and activity holidays in France. They are designed to offer independent walking and activity based holidays to those people who are looking for maximum flexibility. Each holiday page is by region. Some regions have more than one rental property on offer. These are detailed in the "Accommodation and price" tab. We have selected some of the best and (sometimes unusual) historic properties (villas, chalets, cottages etc) set in beautiful regions where great walks, activities and sight seeing is all close by. We also offer some good value properties for those looking for a budget walking holiday. We will supply customers with information about the area as well as suggested walks. You can do as much or as little walking as you wish. Please follow this link if you would like more general information about our self-catering walking holidays. Self catering walking holiday in a beautifully restored farmhouse in a beautiful rural part of the Tarn in south west France. Explore on foot nearby medieval hilltop towns and the three rivers, the Tarn, Aveyron and Viaur that cut through the landscape giving it a distinctive character of deep rocky gorges, steep wooded valleys and high sunny plateaux. Or simply relax by the swimming pool with a glass of wine! A choice of rental properties allowing you to discover the many facets of the Beaujolais at your leisure. Varied walking through vines, forests, medieval villages or along beautiful ridges. There are many walks to choose from, plenty of possible excursions and lots of welcoming wine producers happy to let you taste their wines. Quiet French region where you'll have the paths all to yourself. A choice of self catering rental accommodation in Pralognan-la-Vanoise, the gateway to the Vanoise National Park in the French Alps. Good trails give relatively easy access to a number of day walks exploring an unspoilt wilderness with souring alpine peaks rising majestically above beautiful valleys.